Don’t miss a thing… join us at DIY Cozy Cottage on Facebook to get updates for all of our new sweet n saavy projects – posting 3 to 10 new projects everyday! 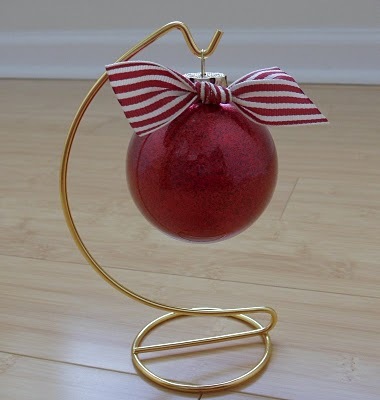 These glitter ornaments totally rock! They look like they come from a high end boutique, but yes you can make them in a jif with a few simple items and a whole lotta love! And usually as much as we love to craft wtih glitter, well…. it’s a bit of a mess, not with this project! Over the years I’ve made lots of homemade ornaments, and each year I love the memories of each as I put them up. These are easy enough and take no time at all so you could make a whole set for a gift this holiday. Rock your glitter glam already! This inspired project comes to us from Greenbeans Crafterole, tell them DIY Cozy Cottage sent you! This entry was posted in gifts & crafts, holidays and tagged Christmas ornament, Christmas tree, DIY cozy cottage, Do it yourself, handmade glitter ornaments, Holidays, ornament on November 28, 2013 by Presley-Love. Who doesn’t love Christmas ornaments? Back in the old days, people made their own ornaments! How about really getting into the tradition and spirit of The Yule Tide, and make your own? It has to be wonderful to see your Christmas tree decorated with ornaments that you and your family made yourself. You can’t get more special than that. Click here for instructions for making 25 different kinds of ornaments! This entry was posted in gifts & crafts and tagged Christmas, Christmas ornament, Christmas tree, Decorations, handmade Christmas ornaments, holiday, homemade Christmas ornaments, ornament, Shopping, Yule on November 19, 2013 by reidenhol2013.